La licence vous donne les outils qui feront de vous un spécialiste de la planification et de la protection contre certains risques. D’une part, vous acquérez une connaissance large et approfondie des mathématiques, des statistiques, des probabilités, des informations, de l’analyse et du traitement des risques. De plus, vous vous familiarisez avec les professions économiques, juridiques, financières et comptables. En plus d’acquérir les concepts et les principes de base, vous développerez des compétences générales pour la pratique, telles que la résolution de problèmes, la créativité, le sens de l’éthique, l’autonomie, l’efficacité et la capacité de communiquer. Au cours de la dernière année d’études, vous pourrez concentrer votre formation spécifiquement sur les risques de la vie, les risques de dommages (incendies, accidents et risques divers), les risques financiers, les risques ou la retraite de régimes collectifs. Aimer l’acquisition de compétences en mathématiques, statistiques et informatique. Aimer exercer un métier concret et pratique. Analyser et comparer les données et déduire des probabilités. Aimer travailler en équipe. Avoir un esprit logique et avoir d’excellentes compétences en mathématiques. Etre pragmatique et avoir le sens de l’initiative. Etre précis, méticuleux et méthodique. Avoir un bon sens critique et analytique. Communiquer facilement. Les compagnies d’assurance et les cabinets de conseil restent les principaux employeurs. De plus, l’intervention des actuaires dans les domaines non traditionnels est de plus en plus demandée, en particulier dans les domaines des investissements, de la gestion des risques et de la planification financière. Notions of risk: insurable, uninsurable. Risk types: life, non-life; short and long term. Life insurance contracts: general principles: traditional insurance, universal insurance; annuities; selection; examples. Non-life insurance: general principles; auto, home, responsibility; classification; examples. Health insurance contract: general principles; private insurance; selection; examples. Reinsurance concepts purpose; types of contracts; examples. Various measures of interest. Value equation. Annuities certain, constant payment or not. Repayment of a loan: progressive damping, sinking funds, possibilities of prepayment and refinancing. Evaluation of bonds and shares. Various performance measures. Duration and convexity. Matching and immunization. Elementary combinatorics. Risk Management Basics. Modeling unique risks by random variables, distribution and types of risk, study of normal random variables and their relevance in actuarial science. Elementary notions of premiums: moments of a random variable. Grouping of homogeneous risk and central limit theorem, moment generating function and probability. Multiple risk modeling random variables, joint distributions, convolution products and are random. Updating information: conditional expectation. Reminders of functions of one variable (limits, sequences and series, derivatives and integrals). Introduction to multivariable calculus (limits and continuity, partial and directional derivative, multiple integral). Differential equations of first and second order and higher order. Laplace transform (definition, transforms basic functions, inverse transforms). Introduction to Microsoft Excel spreadsheet. Introduction to algorithmic concepts and programming. Algorithmic structures: assignment, sequence, choice, loop. Learning a programming language (Visual Basic for Applications) required to code algorithms. Syntax and semantics, simple and structured data types, control structures, procedures and functions, recursion, reading and writing data. Programming standards. Access to the databases. Portfolio Theory. Structure and cost of capital. Debt policy. Modigliani-Miller theorems. Perspectives, functioning and efficiency of markets. Payment of dividends, business taxation. Characteristics and uses of financial instruments. Structure of interest rates. Actuarial Applications. Distribution of a random variable, random samples, order statistics, point estimates, confidence intervals and hypothesis testing. Application of stochastic simulation. General risk management. Introduction to life insurance rates: mortality table, unique net premium, net level premium reserve. Introduction to Non-Life Insurance Rating: frequency and severity; applications; pricing of the premium; deductible and selection changes; Unlike these stages between life insurance and non-life insurance. Introduction to the programming language R. Introduction to stochastic simulation. Numerical methods (fixed point, Newton-Raphson, interpolation, integration). Linear algebra (systems of linear equations, diagonalization, eigenvalues, eigenvectors). This course aims to develop the student’s ability to understand the functioning of an accounting system for the registration of an operation in the accounting records until the preparation of a complete set of financial statements. Thereafter, he will be able to read, understand, interpret, and broadly analyze financial statements. He will discover the limitations and constraints of financial accounting and will include accounting policy choices that are needed. Finally, learn how accounting information can respond to the needs and concerns of the main users. Simple and multiple regression: least squares method, Gauss-Markov theorem, multicollinearity, models qualitative variables, heteroscedasticity, weighted regression, residual analysis. Generalized Linear Models: Models, inference and validation. Estimate adequacy and forecasting. Presentation and integration of these concepts in the context of actuarial applications. Survival functions on a head. Mortality measures. Insurance benefits and annuity: discrete approach, continuous approach, particular cases. Calculation of pure premiums; discreet approach, continuous approach, annual bonus, special cases. Sinitres distribution and frequencies; introduction to bootstrap; semi-parametric models; applications with numerical examples. Description and evaluation of derivatives: binomial trees and Black-Scholes approach. Greek letters stock options. Application of Monte Carlo simulation methods and variance reduction techniques. Futures evaluation. Financial risk management techniques. Actuarial Applications. Definition, integration and peculiarities of different protection mechanisms. Cover different contingencies and benefits. Illustration based on the Quebec and Canadian contexts. Introduction to finance. Reserves for basic contracts. Multi-decay models. Basic multi-decay models applications. Models with two lives: a joint life and last survivor. Credibility theory: classical and Bayesian approaches, models of Buhlmann and Buhlmann-Straub, estimation of structural parameters. Introduction to pricing and provisioning in general insurance: classical methods and presentation in a formal setting using the generalized linear models. Classification of random processes; Markov chains in discrete time, Chapman-Kolmogorov equations, limiting probabilities; Poisson process and generalizations; Brownian motion trajectories properties; stochastic simulation. Presentation and integration of these concepts in the context of actuarial applications. This course aims to improve the ability to communicate clearly and concisely, both written and oral, content related to actuarial activity. It results from a cognitive objectives of the actuarial program: to develop communication skills. Note – This course aims to consolidate the general knowledge of French and knowledge of university-level French. Risk models for a portfolio over a given period. Digital risk aggregation methods. Dynamic models of risk and ruin theory. Risk measures. Modeling, quantification and risk management in the various areas of actuarial practice. Applications with simulation and numerical examples. Introduction to legal terminology. Description legislation and the legislative framework related to actuarial practice. Contracts and other obligations. Insurance law. 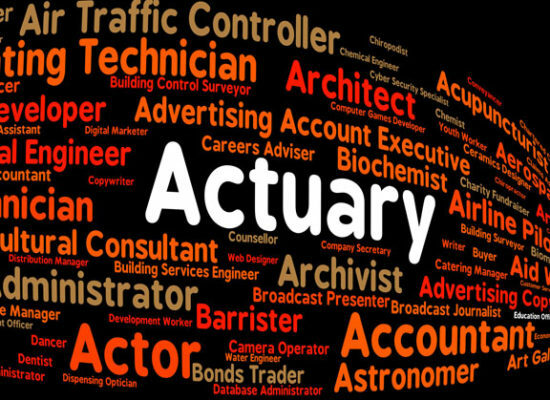 Characterization of professional acts of the actuary and the resulting responsibilities. Professional organization. Ethics, Code of Ethics and Practice rules. Estimated survival models. Basics: types of studies, truncated distribution, random variable transformation method of statistical differentials, exposure, central rates and probability of death; complete data, incomplete data; method of moments, maximum likelihood method; parametric models; Demographic rating. Population mathematics stationary population; stable population, population projection. Graduation Concept tables. Projection notion of mortality tables. Presentation of applications in pension and life and health insurance. Valuation of derivatives: Ito Lemma and derivation of the Black-Scholes model. Extensions to the Black-Scholes model. Stochastic interest rate models and fixed income evaluation. Real options. Credit risk, liquidity risk. Behavioral finance. Actuarial Applications. Assets: traditional investments, alternative and derivative products. Liabilities of financial institutions. Investment policy, matching and allocation of assets, risk management. Optimization and immunization techniques. Liability-driven investment. Assessment and performance attribution. Regulatory and normative framework. IT concepts. Objectives, types and components of a pension plan. Pension formulas, accessories contributions and benefits. Notions of pension mathematics. Legislative and fiscal aspects. Professional standards. Finance and administration. This course aims to deepen some traditional methods of establishing loss reserves (including the discount concepts and margins for adverse deviation) and evaluation of the adequacy of the unearned premium. Concepts of solvency and dynamic review of capital adequacy (DCAT). Financial statements. Presentation of P & C-1. Practical work simplified actuarial valuation. As part of this course the student is expected to achieve one or more works under supervision of the teacher. The course objective is to introduce students to various aspects of professional practice as well as recent developments in actuarial science, within personal insurance. The notions of the role of the Corporate Actuary, dynamic examination of creditworthiness and Canadian insurance model is processed. Analysis of cash flows from insurance contracts. Life insurance with participation. Universal life insurance. Insurance related to stock values. Options embedded in the insurance contracts. Models with random stochastic economic environment and mortality. Cost and financing of public and private collective pension schemes. Statutory and tax considerations. Retention formulas, stabilization funds, risk premium, sharing expenses. Financing of a public or private pension plan; distribution and capitalization. Actuarial valuation methods; theoretical model and applications. Analysis of gains and losses. Cost accounting. Valuation of assets. Actuarial valuation and choice of assumptions. Solvency of a regime. Definition and determination of the range of risks to which a company is subject, particularly a financial institution. Internal and external environment. Key skills assessment of risks and risk mitigation strategies. Understanding of regulatory frameworks and regimes that promote and guide the use of risk management. Economic capital of an insurance company. Notions of stationary and non-stationary processes. Filters and smoothing techniques. ARMA and ARIMA models. Notions autocorrelation and partial autocorrelation. Determining a model, estimation, anticipation and matching. Models for seasonal series. Presentation and integration of these concepts in the context of actuarial applications. To enable the student to perform specific work in research environment. Assess the conditions of application of knowledge and specific to a research environment concepts. A written report and an oral presentation are required after the training. Theory and application of four classical data analysis multivariate methods: principal components analysis, correspondence analysis, discriminant analysis. Classification. Learning software facilitating the use of these methods. Frequency tables of two variables: proportions, odds ratio and relative risk, tests and measures of association, ordinal variables, paired data. Frequency tables with three variables: marginal association and conditional association, Simpson’s paradox. Generalized Linear Models: Poisson regression and binary logistic regression, conditional, ordinal and multinomial variable selection and measurement of model fit. Analysis of data using statistical software. Designing a questionnaire. Simple and stratified sampling techniques. Treatment of non-response. Methods and the quotient of the regression for the use of additional data. Cluster sampling techniques, systematic and multi-stage. Sampling weight. The objective of this course is to give students an overview of DTIs. The student will, from knowledge gained in the core courses in finance, apply knowledge to the circumstances of institutions to deposits. Following a thorough review of the key participants of the financial markets, we will examine in detail the application of various modern techniques in the management of depository institutions (banks, savings banks, etc.). Students will have the opportunity to make a practical application of theoretical concepts through examples of analysis of banking management strategies. Examples of analysis of banking management strategies will be based, to the extent possible, on actual data obtained from a financial newspaper (Financial Post). The course aims to make students aware of the importance of the international dimension in daily financial management and financial strategy of companies. The aim is to develop the student’s ability to understand and analyze the major problems of financial decision in an international context. Specifically, the course covers the following aspects: the functioning of international financial markets, motives and risks of direct investment abroad, the choice of investments in an international context and financing of international operations. The objective of this course is to analyze the financial markets and their main financial instruments and their role in intermediating funds and risk. First we proceed to the description and on examining the role played in these markets, financial institutions and regulators, especially in the Canadian context. We analyze, subsequently, the term structure of interest rates and volatility in fixed income securities. We then examine the government bond markets, corporate and international. In the second part of the course, we study fixed income securities with option clauses, then we proceed with the review of major risk financial intermediation markets classified by instruments that are traded there, or the securities markets backed by debts, futures, options and swaps. This course aims to familiarize students with derivatives such as options, futures contracts (forwards and futures), swaps and others. It allows students specializing in finance at the undergraduate level, to acquire the basic concepts on which modern practice of finance relies. The course provides a description of how different derivatives markets, institutional characteristics of these markets and their functioning. It also allows students to build these product use strategies, assess the various derivatives and see related applications of these tools in different areas of corporate finance, portfolio management, risk management , etc. The key function of financial systems is to make the link between economic agents who save and economic agents in need of financing and credit. This course analyzes the different aspects of this relationship in Canada: the great variety of monetary and credit instruments; how the rate of return on these instruments are determined; the development and organization of Canadian financial institutions (banks, near banks, etc. ); the regulation of this sector and its challenges; the Bank of Canada and the relationship between monetary policy and financial markets. Introductory course in development economics. Topics include: poverty, inequality of resources, the rural economy, the functioning of markets in this sector (particularly the credit market), the role of economic growth, international trade and institutions in the development. Thinking about the mechanisms underlying development problems. Analysis of economic relations between Canada and the United States to better understand their influence in the development of Canadian and Quebec economic policies. Critical study of sectoral issues, guidelines and trade disputes between the two countries. Features of the evolution of trade flows and the Canada-US agreements. Interdependence between national economies, or integration of the international economy. The course is essentially analytical, although references to historical developments and contemporary issues are common. Special subjects: international specialization, protection, economic community, monetary relations in classical optics and that of Keynesian macroeconomics. Public sector nature and characteristics that distinguish it from the private sector. Criteria for allocating resources. Income redistribution function. Special problems in the federal system of government. Political and administrative process of developing economic and financial policies. Microeconomic effects of public spending, taxation and borrowing. The objective of this course is to introduce the student to the risk management and to familiarize with the basic concepts specific to insurance. Topics include managing individual risks and those of the company; instead of the “Risk Management” in the organization and its effects on profits; risk identification and analysis; the probability of risks; the various risks to property, income, responsibility; investment analysis and decision-making in risk management; various forms of insurance. Oriented programming in C ++ object. Elements of syntax and semantics. Implementation of classes: encapsulation, methods and class attributes. Overloading methods and operators. Notion of contract and unit test. Programming standards. Inheritance, polymorphism and class hierarchy. Memory management. Error handling and exceptions. Standard library C ++ (STL). The primary goal of the course is to identify the causes for success in the handling of money. The examples chosen shall be continuously paint a historical panorama that stretches from ancient times to the present. The selection was made taking into account, for each major financial, of innovations in financial techniques, institutions that have been bequeathed and influence on the course of events. Architecture DBMS software. Relational Model: properties, constraints and relational algebra. Study of advanced operators and their properties: division, outer joins and semi-join. Functional dependence, calculation of the closure. Normal forms. Depth study of SQL: DDL and DML. Relational Views: constraint for the update. Indexing and optimization. Interface with an 3GL (Java). Mechanisms for persistence and data management and transaction recovery. Overview of advanced DBMS concepts such as distributed DBMS, OLAP, and Subject. Order concepts: behavior best case, average case and worst case. Notion of abstract and modular type. Generic programming. Classic data structures: lists, stacks, queues (with and without priority), the trees, graphs, dispersion tables and binary heaps. Sorting algorithms. This course aims to introduce students to the main activities of management in the operation of a business. Following the development of a systemic framework situating the role of managers and the decisions they make are successively discusses the purpose and business strategies, planning, organization, management, control and sharing. Readings and exercises are performed, as well as teamwork. The preferred self-learning formula is supported in class by greater supervision of teacher. This course focuses on key marketing decisions. Most of the course consists of a presentation of the variables of the “marketing mix” (product, communication, distribution and price) in a management perspective. Then, integrating all the strategic planning activity is carried out by the students, using the method of case analysis, and that, in specific application areas: services marketing, international marketing, industrial marketing, marketing innovation and public and social marketing. By integrating historical, economic and sociological, this course introduces the student to the different types of regimes and political systems, their operation and the problems they face in their relationships with their environment. Study of the international system; historical formation and ideological foundations; types of systems and transformations; Contemporary system; conflict process; Cooperation Process; transnational forces; major topics of current international debates; diplomacy and foreign policy. The courses ASR-2100, MNG-1000 and RK-1000 are also available in English: ASR-2103, MNG-1002 and RK-1101. This program offers full-time-type journey spanning over 3 years (6 sessions) or 3 years (7 sessions), by arrival to the program session. Students wishing to pursue part-time studies is invited to contact the contact person of the faculty. Successfully during ANL-2020Intermediate English II. The student who demonstrates that he has acquired this level (TOEIC: 675) during the test administered by the School of Languages can choose an English graduate courses, including ANL-3900 Business English course or, if it acquired the Advanced level English II (TOEIC: 825) a course of another modern language. This program offers international profile, as part of this profile, a number of places for students wishing to pursue one or two sessions of study at a university outside of the country. The student is asked to contact the program director to find out the eligibility requirements for this period of study.